By Robyn Brody A report from the third Blue Stars camp of the season. First off, let me point out that it was all of about ZERO degrees outside in Minnesota where the camp was held. Needless to say we held visual blocks inside! It all started out pretty typical -- check in with the Furlano brothers (if you don't know who they are, let me just say that if they are of the highest ranking of Blue Stars Royalty if there exists such a thing). There were lots of big hugs, names and excitement exchanged. After a quick meeting with the corps director, it was off to sectionals. The Blue Stars rehearse during a recent weekend. The brass line was herded off across the parking lot. This is where the first really cool moment occurred, for me at least. After a nice long warmup, we began our repertoire with a chorale from our brass packet that we have focused on in past camps. It's quite beautiful, and standing in that church, with silver bugles reaching far out on either side of me as far as my peripheral vision could see, I felt a little bit of awe as the echoes of our resolved chord shimmered in the air. I guessed it was then that it really dawned on me that this brass line has a special chemistry already. Little did I know that before the conclusion of camp, I would see this property (whatever it is that defines chemistry of a group) manifest itself in the corps proper, like a color of the sunset that is impatient to fill the sky with its beauty. It amazed me that it happened so soon, with such a varied and vast group. When I awoke on Saturday morning, or actually, when I eventually dragged myself out of my sleeping bag after a bout of being harassed by a handful of vets for my bed-sluggedness, I was ready to go! At high brass visual, the second really cool moment occurred. I got into the back where I can get a good vantage point, and I was blown away. 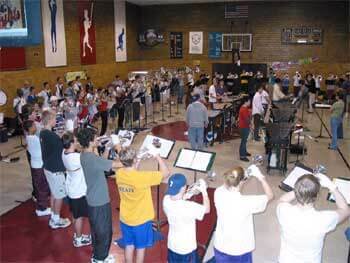 I could feel the focus and concentration of this portion of the horn line, which also happened to be a third bigger than our entire 2003 horn line. Yeah, I think the only thing that can describe it is sweet. I'm skipping some things here. First of all, the horns read "America/O'Canada," and in one night had it sounding good. We learned the ballad in one fell swoop and had ourselves (well, myself at least) in near tears every damn time we played it. Another great moment -- uniform fittings. The feel of that particular fabric on my skin, the way I couldn't help but to stand a little straighter even though I was barefoot and hardly anyone could see me -- little reminders of why I keep coming back. Fast-forward to ensemble rehearsal that evening. Finally we had the all the musical entities of the corps together, and all around me I could feel the electricity sparking as we began creating our show. I can't tell you the names of the pieces, but I will tell you these two things. I play more notes in my opener this year then probably my whole show last season (at least that's how it seems). And not just notes -- crazy kinds of cool notes. Our ballad is probably one of the most beautiful I've ever heard on a drum corps field. That's all I'm going to say about it for now. I went to bed feeling deliciously sore all over and exhausted. Unfortunately, I was kept up half the night by the approximately seven people that were snoring louder than I ever thought humanely possible. Alas, the downside of sleeping in a room with your 100 closest friends -- well, attempting to sleep. Of course the next morning I was wrapped tightly in my cocoon for a good half hour after our wake up call. But this was it, our last day together until next camp, and we all knew how excruciating the time between is. We got ready for "show and tell," where each section performs for the rest of the corps, staff and alumni what they each worked on all weekend. What I appreciated most about our work as a corps was our efficiency and constant forward momentum. We accomplished a great deal of things in a short amount of time, which is a testament not only to the skill of the staff, but the maturity of the members as well. It was then, as we performed together, and that invisible web of electricity snaked its way around the room to bind us all together, that I was struck by the sense of how awesome drum corps is. This isn't the first time this has happened to me, and I'm sure it won't be the last, but the power of the feeling never lessens. Robyn Brody is a third-year mellophone player for the Blue Stars. "I drove 2,000 miles in May of 2002 with no idea what I was getting into, and now I'm hooked. I even moved to Madison in part so that I could be close to the family that I so quickly acquired," Brody said. She is a music education student at the University of Wisconsin.